A company that proclaims the name of alternative energy must follow through in all aspects of the corporate culture. It’s not enough to make a solar cell product that saves a home on electricity, the product should be made of earth friendly and sustainable products and the company itself should abide by certain spin off rules. These rules or guidelines should include the fact that the company itself is reduced its own carbon footprint, partnering with other companies that are on the same energy efficient and earth-friendly path and investing their own profits into improved products. 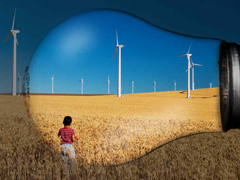 There are all kinds of pros and cons regarding some of the general topics of alternative energy. A guideline for you, as an investor, is to also realize that a true alternative energy is not one that will produce any byproduct that is actually more detrimental to the environment, people or earth. You might be a proponent of nuclear energy, but, using this guideline – nuclear energy is actually one of the worst and should not be considered as an alternative energy investment. If you disagree, just look at the mountains that are filled with toxic byproduct waste, in containers that will only last hundreds of years and yet the waste will take thousands of years to reduce in radioactivity. A good no-load mutual fund investment for alternative energy can come in surprising topics as well. Recycling is a major topic and in the forefront of most of the world’s corporations. What to do with the mass amounts of plastics, Styrofoam, paper and glass has become big business. Most communities in the U.S. have some kind of recycling program and the waste management companies are taking their investment into alternative energy even further through the use of non-electric vehicles. If you contact the Environment Protection Agency, you can get a list of the best counties in the country involved in the recycling efforts and work with the companies that are showing the highest level of profitability. As we continue down the path of additional alternative energy sources we can expect that the requirements for a company to comply with that title will become more defined. You will need to keep on top of this topic to ensure that you invest your no-load mutual funds in the best and most wise direction.